In stock -This product will ship today if ordered within the next 3 hours and 5 minutes. The advantage of silicolgel exists in the large and highly reactive surface of silicic acid. When taken internally, it forms a protective and soothing coating over the lining of the stomach and intestines. 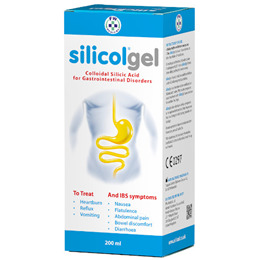 Silicolgel contains silicic acid which is a compound of the mineral substance silicon and oxygen in a colloidal (highly dispersable) and hydrated form. Gastrointestinal disorders are usually caused by irritants and by harmful and toxic substances as well as pathogens. Due to the adaptive or binding properties of colloidal silicic acid, it physically absorbs or binds irritants and harmful and toxic substances as well as pathogens. This renders them harmless so that they can be removed naturally through the intestines and out of the body. Silicic acid can also bind gases and reduce excess acidity. 3.5g Silicon dioxide in 100ml Silicic acid gel. Preservatives: Sorbic acid (E200), Sodium benzoate (E211). Shake bottle well before use. Take at least 1 hour before or after the intake of medicines. Take 1 tablespoonful (15ml) three times daily, preferably before meals. Shake bottle well before every use. Use only until Use By Date. 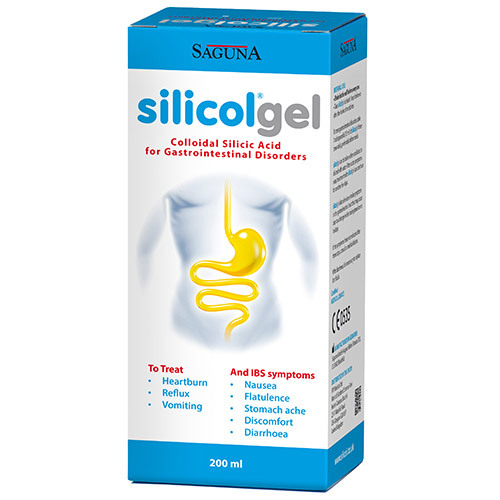 Below are reviews of Saguna Silicolgel Colloidal Silicic Acid - 200ml by bodykind customers. If you have tried this product we'd love to hear what you think so please leave a review. Excellent product, and value for money much more expensive in Boots etc, delivery service first class.